We’re going to have to come clean. We think gender reveal videos are a rather silly, attention-seeking fad that we’d love to see go away forever. Don’t get us wrong, we love laughing when they go off the rails (as they so often do), but like most internet fads, they are ultimately pointless and repetitive. We think we’ve found a gender reveal fail that GM Authority readers can get down with, though. 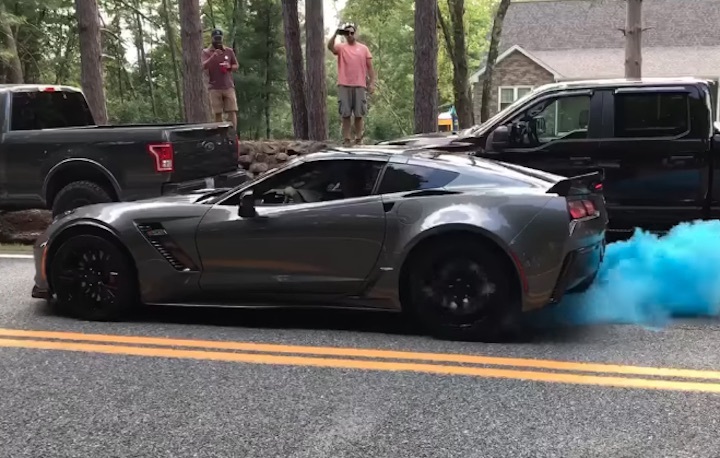 In this gender reveal video, we see a young man with his new C7 Chevrolet Corvette Z06 revealing the gender of his new baby by doing a burnout with special tires that produce colored smoke. We think this guy might want to get his money back, though. The tires produce a pathetically low amount of blue smoke before the blue runs out and begin producing regular white tire smoke. One commenter on the video even joked that the Corvette driver must be having a stormtrooper due to the lack of blue smoke. We must give credit to the father of the child here for using this gender reveal as an excuse to do a good burnout, though – as a good Corvette owner does. We’ll also extend our congratulations to him and his family – despite our earlier saltiness. You probably don’t need reminding, but the C7 Corvette Z06 produces 650 hp from its 6.2-liter supercharged LT4 V8 – more than enough to convert your rear set of rubber into a cloud of smoke on a whim. This video has us thinking of our favorite gender reveal video of all time (at this link) in which a man filled with bravado attaches a blue smoke grenade to the rear of his ATV and attempts to do a donut on his residential street. He ends up flipping the ATV, hilariously, bringing about an anticlimactic end to his little stunt. Looking at it, I thought it was a batman, a sophisticated design, and more of a blue smoke, when it came to the road it felt like this was a race.